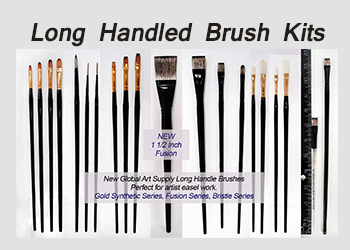 All our high artist quality brushes now come in longer handles for easier artist easel use. 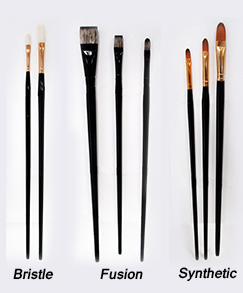 These high quality wooden handles make stepping back on your brush for more casual work as well as new Art of Painting techniques easier to accomplish. Each handle is double dipped for long lasting quality. Lightweight handles give you greater control when you step way back because the weight of the brush is at the tip where all the work is done. You control how far back you use the brush. Choose your brush below. You can also choose the "Kits" page for extra saving on groups of brushes. Don't hesitate to write us if you have any questions about our artist brushes. Created in America for consistent high quality!